Lepidozamia peroffskyana (picture right) is endemic New South Wales and Queensland but is an excellent cold tolerant cycad that grows successfully at least as far south as Melbourne, with examples in gardens in Tasmania as well. Sometimes called the ‘pineapple cycad’ because of its large seed cone, this is a rainforest plant and requires part shade and good drainage to grow well. L. peroffskyana is named after Count Peroffsky and is one of only two in this species the second one being Lepidozamia hopei, both are grown for the large deep green foliage. Both will form multiple heads in time. Neither species produce flowers as such, the large seed cone however is a fantastic feature, reaching nearly 1m. 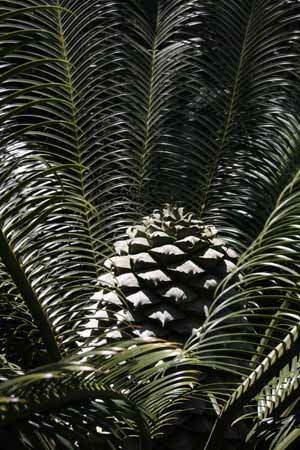 As the cones mature they break down to produce fleshy red seeds used for propagation. Although L. peroffskyana can reach heights of 7m plus they are very slow growing. L. hopei is the taller of the species, in ideal conditions growing to nearly 20m. Landscaping uses are nunerous, as shade loving plants they are values for the ‘tropical’ feel that the foliage provides. Excellent in a shady position in the garden border. Old foliage can be pruned to inprove appearance. The price of larger plants is high due to the slow growing nature, however younger plants are attractive and certainly worth looking for.